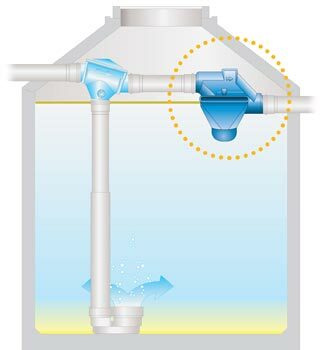 Water leaving the filter enters the storage tank through the 'calmed inlet'. The inlet prevents the disturbance and re-suspension of fine sediments that gather on the bottom of the tank. Another important function of the inlet is the introduction of oxygen into the lower layers of the tank which maintains a fresh supply of water while preventing anaerobic conditions from forming. Once a maximum level is reached in the tank, the innovative overflow siphon, with its skimmer effect, removes particles lighter than water (e.g. flower pollen, oils, etc.) that float slowly to the water surface. Removing this floating layer of surface pollutants through regular overflow from the tank is important in order to maintain high quality water and allowance of oxygen diffusion at the water surface. 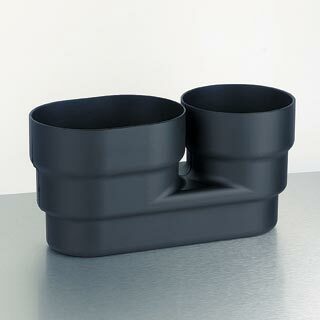 The narrow slits in the overflow siphon prevent rodents from entering the tank. Mono and Duo models are pictured here. The Mono unit is used when the filter is located somewhere outside the tank and the Duo unit is normally used in combination with the RainKeeper Cistern Filter as shown in the diagram. This model is well-suited for PE tanks. An air-filled ball suspends the floating inlet filter just below the water surface where the cleanest water resides. 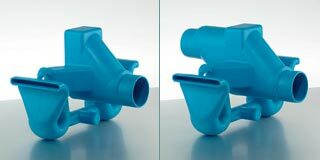 A high quality 1-inch diameter flexible hose allows for connection of the floating inlet to a pump or suction line. 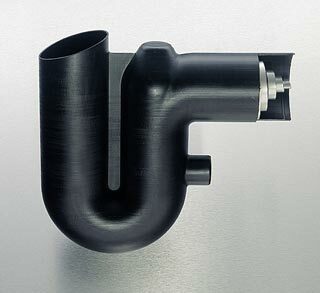 Filter is made out of lead-free brass with a 1.2 mm stainless steel screen and a built in check valve. 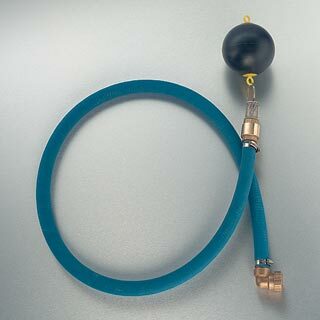 Flexible suction hose is specially formulated to resist biological activity and is available in custom lengths.